The Domaine de la Pépière is an estate of the Muscadet, in the western wing of the Loire Appellation. The Muscadet wines which are overwhelmingly white have made a comeback in the last years, they were a bit looked down for being light fresh wines but thanks to the good work of several winemakers there, wine amateurs discovered that there could be terroirs behind a Muscadet, and even that these wines could age well. The Domaine de la Pépière makes very beautiful Muscadet wines on terroirs thick with granit stones and debris, and I discovered during my visit there that they have also hidden gems with three very nice red wines, an oddity for the Muscadet Appellation and another proof that good winemakers shouldn't limit themselves to the varieties and colors sanctionned by the Appellation system. Another thing is the fact that in spite of a relatively large surface of vineyards (28 hectares), Marc Ollivier farms organicly and took special steps at the harvest and handling of the grapes so that his wines could be vinified without lab yeasts and nutrients. Checking an old Melon-de-Bourgogne vine One of the particularities of the terroir de Clisson which lies near the village of Maisdon-sur-Sèvre is the high-density of granite in its soil, which gives a particular minerality edge to the wines there. On this granite soil, Marc Ollivier grows his reds as well as his Granite-de-Clisson (white) Muscadet and his generic Muscadet cuvée, named Domaine de la Pépière. The type of granite in this terroir has a lot of silica in it, which makes the soil very poor. It is a mix of sand and stones with very little clay where the water just passes through, which makes very light soils which heats up fast in spring. Most of his red vineyards are young and have been planted in the 1990s' and 2000s', there's just a Cabernet Franc plot which is 40 years old. One interesting thing to note about Marc Ollivier's reds is that unlike other growers around, he planted the red vineyards on this qualitative, south-western exposure terroir where ripeness is particularly good. As the Muscadet Appellation is only for the white Melon de Bourgogne, the red varieties are usually given the less-intertesting terroirs, as they'll not be labelled as Muscadet but as Vin de Table or Vin de Pays. And if not planted on the right terroir and exposition, there's little chance that you can make a good red in the Muscadet. When he started, he just had these old vines of Cabernet Franc and he didn't know precisely what could adapt well here. For the Côt, it was a challenge because there weren't many places where Cot would work well on granite. the only places you find this type of granite with easily-drying soils are the Northern Rhone, some parts of Beaujolais, and the Auvergne. All the while, there had been some Cot planted in the region in the past. Incidently, some of the replantings he made here are massal selections from the very old Cot vines of Clos Roche Blanche further east in Touraine. And his replantings of Cabernet Franc came very old vines owned by Jacques Carroget of Domaine de la Paonnerie in Anjou. The rock table was so present in the ground that he had to use a bulldozer with ripper to prepare the soils before planting. Marc Ollivier in his Melon de Bourgogne (Muscadet variety) Marc Ollivier says that his vineyard management is classical, with a décavaillonage, where the tractor puts upside down a slice of earth between the rows, after which he alternates plowings with disks or claws. About the disease front, he says mildew is a serious threat, to which they answer with the use of copper under different forms depending of the season (some forms of copper needing more or less water to be active). They complement this copper use with phytotherapy, organic sprayings made with nettle or Field Horsetail, which is a very classical vineyard organic practice (the estate has the Ecocert organic certification). Here, oïdium is relatively inactive on the Muscadet variety, but mildew is the main problem. They're 5 people full time here to work in the vineyard, but he receives very few individual customers which spares lots of time. His export share which is very big (88 %) also helps, as the wine leaves the winery by pallets at a time. Marc Ollivier in the vat room The winery is very modest in appearance, with the vat room and different parts of the facility set in an old building having gone along the years through several modifications with the development of the estate. Marc Ollivier doesn't have a winemaking lineage behind him, he wanted to work outdoor in the region, so the wine trade was an option, he went to Macon for a degree in viticulture, came back from there with a passion for winemaking and worked as an employee at his uncle's winery from 1979. In 1984, his neighbor who was a vigneron died unexpectedly, and he had the opportunity to buy his winery to keep it running. This was then a 7-hectare estate with mostly white Muscadet, the rest being 20 ares of Cabernet Franc. As of last october he had grown up the estate to a total of 28 hectares including 4 hectares of red vatieties. I wrote as of late october because there may be additional vineyards on the way since then. Asked if there were specific teachings in Macon for the particularities of winemaking in the Muscadet, Marc Ollivier says that this is an interesting point, because most vignerons in the Muscadet didn't travel to other regions for their training, they learnt the trade at the Ecole de Briacé, a home-grown viticulture and enology school where most future Muscadet growers go study. Marc and a few other guys of his generation studied in faraway wine town like Macon and they sort of came back in the Muscadet with new ideas inspired by the wine culture of other regions. But Marc Ollivier says that what influenced him the most was his encounters with other winemakers in the Loire Valley, including the ones making natural wines, even if he doesn't consider himself as being part of their movement. Exchanging with all these vignerons made him evolve differently compared to a Muscadet vigneron who wouldn'd have looked elsewhere for his wine culture. Old vines of Muscadet (Melon de Bourgogne) Asked about the particularities of the Melon de Bourgogne, Muscadet's unique variety, Marc Ollivier says that it hasn't many specificities, what can be said is that it's not a variety making high-alcohol wines, even if with an organic farming and yields of no more than 40/50 hectoliter/hectare it's possible to get wines with an alcohol level of 13° but it's exceptional. This variety is not intensely aromatic, he says that if we come across particularly-aromatic Muscadets, it doesn't come from the variety itself but probably from a selected lab yeast. This lack of obvious particularity makes this variety difficult to approach at the beginning, but it does offer nuances in the refined side of the aromatic spectrum. This variety is not fragile regarding the disease problems, and the other thing is that this wine gets its originality through the élevage on the lees, even though this technique has now become mainstream for the élevage of the whites. He says that 20 years ago Muscadet was basically the only region where whites were raised on their lees. The Chardonnay also needs to go through its malo to express itself while here the Melon de Bourgogne doesn't have its malolactic fermentation. Checking the fermenting Muscadet Asked about why in the Muscadet the fermentation vats are usually underground, Marc Ollivier says that while not sure at 100%, he thinks it could have come from the fact that the region had a lot of Italian masons settling in the area, working for example in a now-closed construction company (Bucciol) which made lots of cement vats, and the underground type of vats may have been inspired by the Italians. Whatever, the advantage of these underground vats reside in their temperature inertia and in the height/width ration which permits an exchange with the lees similar to the one obtained in a cask. A "normal" stainless-steel vat is much higher than wide and the exchange with the lees is unsatisfactory. Most of the interest of these underground cement vats lies in the shape and proportion and the inpact on the lees/wine exchange. Usually, the inside is tiled with glass panels, his own vats are tiled with ceramic plates. The press The harvest here is mostly by hand, except a small part for entry wines and bag-in-box wines. The hand picking at la Pépière keeps the grape clusters whole until the press, as he hasn't any of these "harvest pumps" which many vignerons use, and which damage the grapes : he has a container full of grapes lifted above the press and the press is filled by gravity without any crushing beforehand. He says that this detail is very important for the wine and he makes sure that it is do,ne this way every time even though it's much more work to do, with the manual emptying of the container into the press, which is a considerable amount of pain when you harvest and press hectares of vineyards. But he considers that the violent handling of the grape clusters through the use of pumps produces lots of thick deposits or lees which in turn make a decantation necessary to get rid of their thickest part. And the problem is that this unnecessary decantation also takes off some important wild yeasts and natural nitrogen nutrients, which in turn have the winemakers compensate through additives. With his system, the thick lees that he takes away after the press makes only 1 % of the juice compared to 10 % or 12 % if the grape clusters were damaged, this way, he keeps almost all the yeasts and nutrients in his juice [Here again, it seems that non-additive winemaking is possible when winemakers make the step of taking care of the grapes and the juice...]. The vat room Then, there's not much to say about following stage : he keeps the temperature between 18°C and 20°C, not too low even if elsewhere there's a trend to have the fermentation unfold at 12° or 13°C to increase the aromatic side. He doesn't look to boost the aromatic side of his wines, so 18°/20° is fine, he just avoids that the temp hikes up over 20° C because it can make the wine less delicate. The élevage on the lees takes place in the same underground vats, there's no racking. There's no stirring of the lees for the wines that are bottled in the spring, but there are a few ones for the wines with a longer élevage (Clisson and Chateau Thébaud). Some of the bottlings take place from march to august depending of the cuvée, with Gras Mouton being bottled as late as early september and the Crus communaux are bottled after 25 or 26 months. He filters lightly the wines (on clay) for all the whites (not the reds). Speaking of the SO2, he adds a small dose like 1 or 2 grams/hectoliter at the arrival of the grapes on years when the condition of the grapes is not parfect, like in 2010 where there's been a bit of Botrytis here and there. then during the élevage in winter he adds some more like about 5 grams per hectoliter, which is half of average used elsewhere. SO2 is the only additive he uses, and he doesn't add any at bottling, the objective being that there remains 20 mg free SO2 in the bottle, which is usually the case as his adding takes place in the middle of winter. Marc Ollivier with Julien His different white cuvées are Domaine de la Pépière (cuvée classique), Cuvée des Briords (on granite soils), Gras Mouton (on gneiss soils), Clos Cormerais (on gneiss, raised in casks), and the two Crus Communaux Clisson and Chateau Thébaud, makes 6 Muscadet wines with very different styles and expressions. As written above, Marc Ollivier also makes 3 reds from a 4-hectare planted vineyard (only 3 hectares in production right now), about 20 000 bottles per red cuvée (there are 3 of them). A Cabernet, a Côt and a blend. The Cabernet and Côt are vinified through 3 or 4 days of cold maceration, then he lets the temperature go up with the fermentation unfolding for 3/4 days, after which he racks the vat when the juice is between 1030 & 1050, very early before there's much alcohol in the juice with the goal being not to extract tannins and keep a tender, supple wine. The yields are usuall about 40 ho/ha for the Crus Communaux, 45 to 50 ho/ha for the old vines and 55 ho/ha for the generic Muscadet. The reds are about 50 ho/ha, with the Merlot sometimes a bit over that (not this year though). The Merlot goes into the Cuvée Granite, the red blend, where you find Cabernet Franc (50%), Côt (20%), Merlot (20%) and Cabernet Sauvignon (10%). I didn't take notes during this visit but we tasted through all of his wines, great stuff with lots of purity, and for me the reds were also a surprise because I didn't expect to find them in this corner of Muscadet. I was particularly impressed by the Cab Franc 2009 (sold out alas) and by the Cuvée Granite of which I bought a case [picture above : tasting the reds with Marc and Julien, a cool young guy who joined the estate for a few months after working on fishing boats]. These wines aren't labelled as Muscadet and like all of Marc Ollivier wines, they're a terrific value, especially if you buy them at the winery, like these reds cost 3,5 € tax-included and his Muscadet whites about 5 € if I remember, amazing, especially when you taste the wines. Marc pouring his wines 88 % of la Pépière wines are exported, with largely ahead the United States (Dressner Selections -one of the early picks of Joe Dressner in 1990 when he started his company), Canada (Quebec - Vinealis, Ontario -- British Columbia Racine Wine Import), Japan (Makiko Kanai), Belgium. In paris, try the Caves du Panthéon in the 5th arrondissement. For the anecdote, the importer Joe Dressner found la Pépière through a fellow vigneron in Burgundy located not far from where Jo & Denyse have a house in the Maconnais. Noel Perrin had been spotted at the time in the Guide Hachette and Joe visited him to taste his wines, and the vigneron tipped him about Marc Ollivier as they were both part of a group where they shared their contacts. He came over here, made some trials imports in the States and it ended up working. Marc Ollivier says that Joe Dressner can be credited for bringing the wines of the Loire at large in the United States, because he's the one who made all the upstream work to put these wines on the map there, which was far from obvious at the time in the early 1990s'. 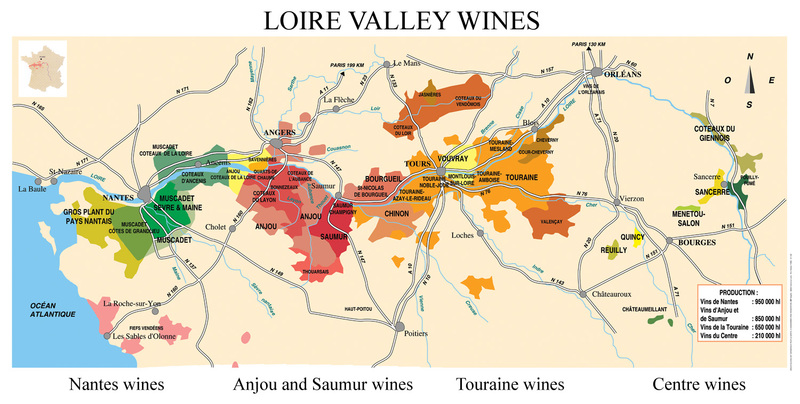 David Lillie of Chambers Street Wines also took part to this awareness job, and Marc Ollivier says that there is hardly another wine shop in the world with such a wide range of Muscadet wines, except maybe in a couple of Cavistes in Nantes. La Pépière44690 Maisdon sur Sèvre This visit took place late october. Read the Wine Doctor's indepth report on la Pépière. Thanks Bertrand, great report, love the photographs too. Oh my! I sure would also love a tour around that vineyard and enjoy even just half a glass of the great wine. did he make you some of his wonderful becasse pate? No. You mean a pâté de Bécasse ? I know he hunts these birds but I didn't have the chance to taste this pâté.